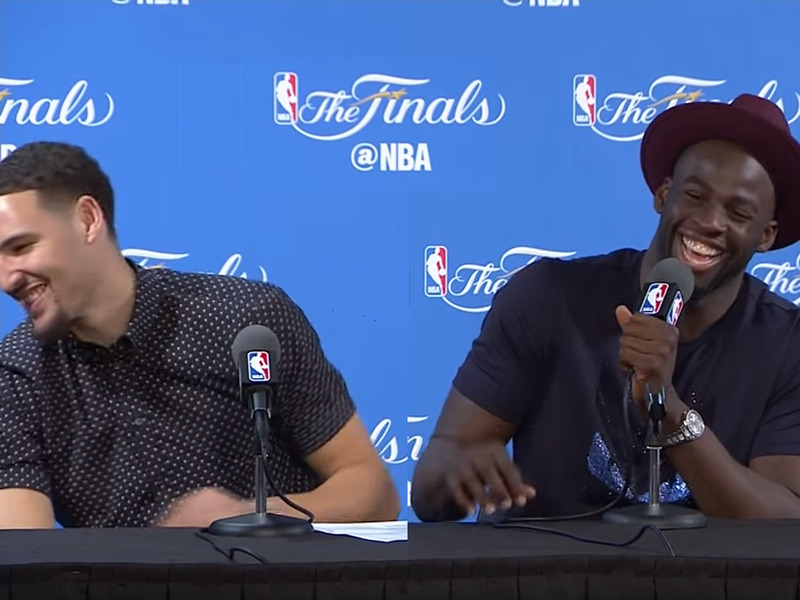 YouTube/Ximo Pierto FinalKlay Thompson and Draymond Green laugh after Thompson joked that the Golden State Warriors were better than the ‘Showtime’ Los Angeles Lakers. The Cleveland Cavaliers pulled off the impossible, winning four out of five games against the Golden State Warriors in the NBA Finals after falling behind 2-0 in the series. Well, it turns out the Warriors may have inadvertently given the Cavs some added motivation thanks to a joke by Klay Thompson that backfired. Zach Lowe of ESPN discussed the Cavs’ comeback on “The Lowe Post” podcast and noted that the Warriors confidence level reached a tipping point after Game 2 that “pissed off” the Cavs. The comment Lowe is referring to was a joke Thompson made at his father’s expense that sparked a lot of debate in the social media world. The Warriors reportedly entered the series feeling like they had already won the championship by beating the Oklahoma City Thunder in the Western Conference Finals. Golden State then took a 2-0 lead in the Finals in dominating fashion, outscoring the Cavs by an average of 24 points. In other words, the Warriors’ confidence-dial after Game 2 was turned to 11. It seemed like a harmless joke at the time. After all, the Warriors had won 73 games in the regular season and were cruising to what looked like a sweep of the Cavs. But while the social media world spent much of the next two days debating which team was better, behind the scenes, the Cavs were fuming at the overconfidence. The Cavs were also worried that it might be true, according to Lowe. “It also made them lock in because the Cavs had an internal debate about ‘Damn, they might be right. They’re that good. We’ve got to play better to hang with these guys,’ ” Lowe said. Of course, the Cavs never come back without a super-human performance by LeBron James. But the Warriors may have also inadvertently helped the Cavs re-focus as a team, just enough to pull off the miracle comeback.